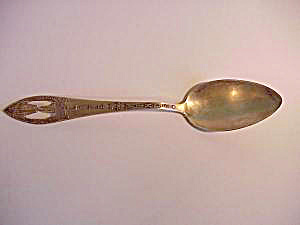 STERLING SPOON "CAVE OF THE WINDS" "MANITOU"
LOVELY STERLING SOUVENIER 5 1/2" SPOON WITH CUT OUT HANDLE SHOWING STALECTITES AND STALEGMITES AND THE WORDS "CATHEDRAL SPIRES" BENEATH IT LEADING TO THE WORD "MANITOU", ALL ON THE HANDLE. RUNNING UP AND DOWN ON THE HANDLE ARE THE WORDS "CAVE OF THE WINDS" . THE BOWL IS PLAIN. BUYER PAYS SHIPPING AND INSURANCE. MONEY ORDER SHIPS NEXT DAY, CHECK MUST CLEAR.